It’s A Bird…It’s A Plane…It’s Super Trump! Visitors to Disney World and Universal may see a new attraction somewhere in the Interstate 4 corridor — Super Trump. Trump fan Dr. Robert Shillman of San Diego paid for the billboard along with one now on display in New York City’s Times Square. “When I was a kid, Superman was my idol because he stood for Truth, Justice and The American Way, just like Donald Trump,” said Shillman. Joel Greenberg, described on the helpthedonaldwin.org as a millennial entrepreneur, is providing the space for the Super Trump Florida billboard. The placement in the I-4 corridor is no coincidence. The corridor stretches through two of the swing state’s two top media markets — Tampa Bay and Orlando. It has roughly 1.5 million voters with no party affiliation. That could be the largest group of unaffiliated voters in the nation and is the reason the corridor is being targeted by both Hillary Clinton and Trump’s campaign. Greenberg, 31, ousted 27-year veteran Seminole County Tax Appraiser Ray Valdes, 78, in the August primary. Political provocateur Roger Stone of Fort Lauderdale, a Trump advisor, appears to have a role in the billboard idea. Judge Nina DiPietro should love this. Her husband David DiPietro is such a big trump supporter. Isn’t this a character role for Trump? He is and always will be a COMIC CHARACTER. Isn’t this also violative of copyright law because the costume so closely resembles the costume of Superman? If so, is DC Comics going to sit back and do nothing? Where is the costume made– in the USA or overseas? Is he permitted to wear the costume because his health is “excellent?” Or does he still have to wear the girdle like he does under his suits? Like Clark Kent is to Superman, does he change his hairstyle (PLEASE PLEASE) and take off his eyeglasses when he changes from Trump to Super Trump so that nobody recognizes him? And if he is Clark Kent, is that a contradiction to the actual Trump inasmuch as Clark Kent is mild-mannered? When he leaps tall buildings with a single bound, are they the buildings he claimed he built, the buildings that he bankrupted, or other buildings? When he supposedly saw the Muslims celebrating in New Jersey after 9/11, was he using his x-ray or telescopic vision or was he under the effects of red kryptonite which caused him delusions? Trump better win or we are all in for a bigger, and better screwing than we got from O’Sama. How anyone in their right mind could even consider voting for the decrepit old hag crooked Killary is absolutely mind boggling. I guess there are enough low information or no information voters that will just follow the rest of the morons and vote for Killary. And this kind of RACISM and ANTI-SEMITISM is why Secretary and US Senator Hilliary Rodham Clinton besides her EXPERIENCE is why I support her for President. @5 noting surprises me about the lack of integrity from Broward anymore. Just the fact that anyone with any ethics or integrity would support someone whose ethical elevator has no bottom illustrates how doomed we are as a country. It is perfectly legitimate to associate Obama and Osama. After all, Obama associated himself with Islam (via his own mother declaring it in his school enrollment) and allowing his publisher to state it in his book. His selling/giving weapons to the nascent ISIS and half hearted efforts to defeat them. His many advisors are muslim like Jarrett and the CIA director. Count, you are proudly Jewish so I am confused that you would support the obviously anti-semetic Hilary who is no friend of Israel. It is a fact that Obama was born and educated a Muslim. It is unfair to say necessarily he is a Muslim now. That is something between Obama and his priest, preacher, or his iman…. @8 As a research hidtorian who has dealt with Hawaiian records n history since the 1960s n worked for Intraport a prominent Indonesisn firm in the 1960s your statements are BLATANT LIES. 1. President Obama was raised by a Christian Mother and Christian Grandmother in his NATIVE HAWAII. He has attended Christian Protestant Churches his WHOLE LIFE. 3. Through his Mother is related to both PRESIDENTS BUSH. 4. NOT ONE PERSON. 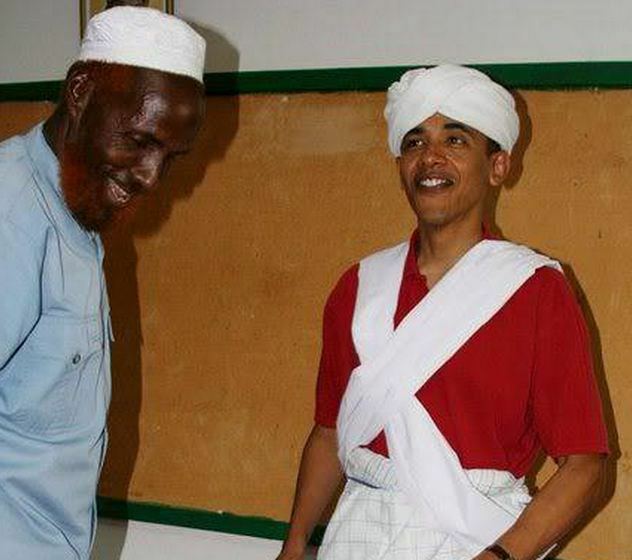 DOCUMENT has EVER BEEN FOUND SHOWING PRESIDENT WAS EVER A MEMBER OF A MOSQUE or ATTENDED A MOSLEM RELIGIOUS SCHOOL. Your post is a WELL DOCUMENTED LIE FROM START TO FINISH. Count, I like you but just how much of that Kool-Aid have you been drinking? You cant be serious Mr Sham! 1. Have a Praetorian Armoured dress. Am I Commander of the Praetorian Guard? 2. I have a Rzeszowski dress – am I a Galician 18th century Pan? 3. I have lots of formal n informal 18th century court dress. I am a Courtier at Versailles? 4. I have a dozen bayerische Trachte as 1/8 Bavarian for Oktoberfest next week am I a Bavarian lord? Burger? I said OFFICIAL DOCUMENTS NOT A WELL KNOWN PHOTO OF A STUDENT TRIP OR A STATEMENT OF RESPECT FOR A MAJOR RELUGION’s FOUNDER. Your proof won’t get a C in junior high school. Our Fearless Leader does not believe that anything is greater than himself and therefore does not believe in Jesus, God the Father or Allah. But anyone with two eyes to see and a brain to think will have to admit that Barry has a certain affinity for Islam. He feigns his Christianity for votes and credibility while bringing in hundreds of thousands of muslim refugees (all the while aware that he is also importing terrorist wolves in sheep’s clothing). He has made America the number one financier of terrorism by illegaly giving billions of dollars to Iran. Barack, who is named after the Prophet Mohamed’s famous flying horse, is actively freeing radical Islamic fighters from Gitmo so that they may rejoin the holy fight against us. Anyone who is clear minded and not deluding himself knows Barack is no Christian.